Reading Karl’s great blog post on repairing a kijiji’d synthesizer, I thought about how sad the original owner must have been when he smoked his nice Korg Poly-800 MKII just by plugging in the wrong power supply. I also thought about how avoidable this is and all the things I’ve had to figure out about power bricks in my travels as an electronics scrounger/repurposer. (d) if the input voltage needs to be regulated? With salvaged gear, I often have to crack the case open and do a little circuit board trace just to figure out which external terminal is ground to answer (a). Sometimes I can answer (b) if I find an internal linear power regulator, say a 7805 (+5V out, so just add 2V to the input, giving a required minimum 7+ input voltage). This discovery sometimes answers (d) as well (if there’s an internal regulator you don’t typically need a regulated external input voltage). just not (consistently) on the device you’re powering with it. No markings at all on this USB hub. This network switch manufacturer helped us by specifying the voltage and current, and that it’s DC (the dashed line with the bar over top). But polarity? This computer speaker manufacturer helped us with voltage and polarity (centre pin is ground, barrel is +V), but we have no idea about current. Smart output voltages – where power bricks could query our devices to ask “how much current do you want and at what voltage?” So civilized! Protection circuits in devices – a $0.04 1N4001 diode can save you from polarity reversal destruction from a strange power brick. A $0.50 bridge rectifier can make polarity a moot point. And a zener diode and big FET would have averted the aforementioned synthesizer over-voltage fail and maybe added $2 to the BOM. Guessing why those don’t generally happen, I’d say (co-operation deficit, cost, cost). A question I’ve received several times asks: “Is it ok to use an external power supply that says 30V for my device that says 9V input voltage?” If there’s an internal linear power regulator, say an LM7806, inside the device you’re powering, the answer is usually: no! 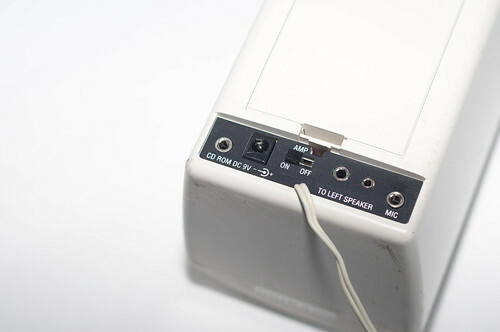 That 7806 (in this example) inside your old answering machine would have to dissipate at least (30V – (6V – 0.7V)) * “current in amps” of power in the form of heat. So at 0.5A that would mean a toasty 12.35 Watts of heat. Not to scare you off of trying, gentle reader, just check the device to be sure it’s not melting. 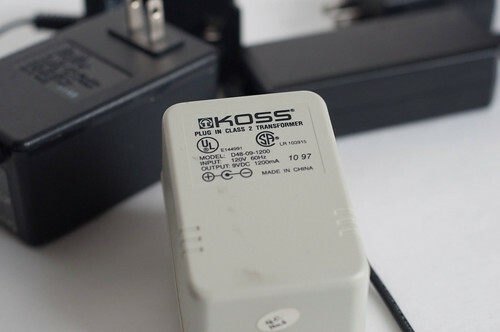 And, while I’m at it, it’s worth mentioning for folks new to electronics that those awesomely useful power bricks (aka wall warts) often have a much higher no-load voltage than labeled on the brick. 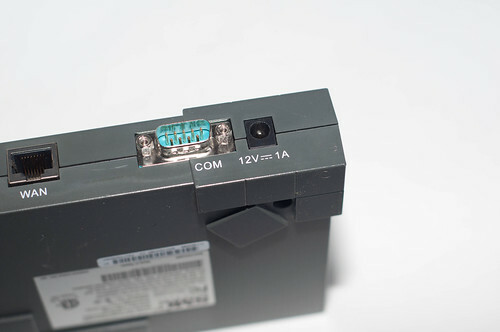 For example, a laptop power brick rated at 16V output may show as much as 22V when you measure it with your multimeter. Once a load is connected, the voltage will drop down closer to the expected 16V. 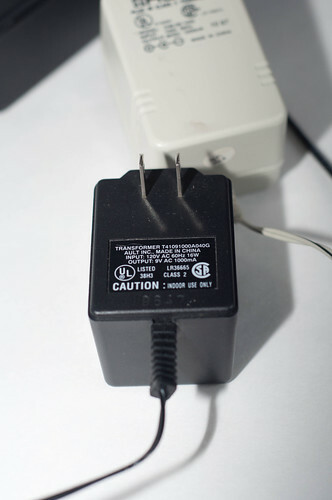 Simple (and cheap) power bricks are simply a step-down transformer to go from 110V AC of your house to something close but above your desired output voltage, plus a few rectifying diodes to go from AC to DC, a temperature-dependent fuse to avoid catastrophic meltdown, and a capacitor for smoothing output voltage and current. These bricks sometimes feature self-healing fuses that will reconnect after a short or other fault are removed. Check the guts on uC Hobby’s teardown. Real simple, which is why you can get these for a couple of bucks. 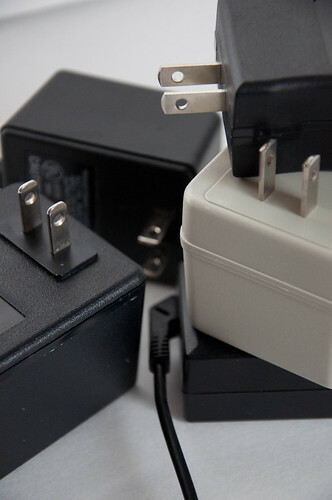 More complex switching power bricks, like the one that powers your laptop are smarter and more expensive than the simple bricks. 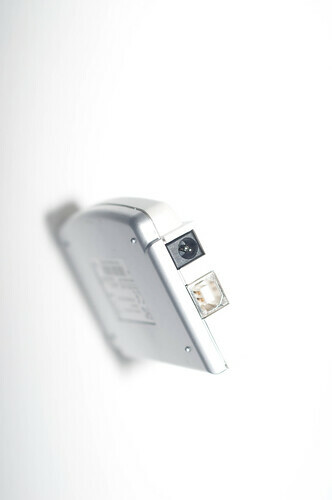 They essentially switch the power from the wall on and off rather quickly and provide just the right amount of current at the correct voltage for your device. 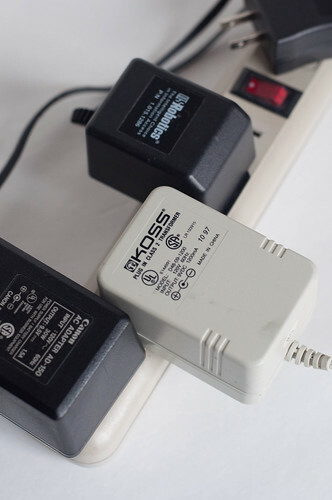 Switching power bricks can provide much more current than simple bricks, which is why you see them supplying your 4 amp laptop. For you makers looking to power your latest LED creation from one of these bricks, I have to point out that some are AC output (shown above) and others are DC output. You probably want DC. Some older and/or specialized devices like modems used AC bricks to either save a few cents on diodes or derive some timing from the 60Hz AC wave. When you’re scrounging, just check the brick label to confirm it says DC output. Hopefully we’ll someday see a rationalization of the physical form factor of wall warts and powerbars so these guys can co-exist in better harmony. There are some ideas out there, but a general solution would be awesome. For all their flaws, the humble power brick is super useful to makers, is found everywhere, and is almost universally free for salvaging. A bit of unsolicited advice: label the new ones as soon as you get ‘em, and stop collecting old ones once you have one box full.